Roller coasters aren’t fun for me. The emotional one I’ve been on the last few days, left me much like a real roller coaster does, in tears. Knowing the time left on our visa has been ticking down, I’ve scoured the internet for months, sending job leads to Geoff. Job leads in Canada, in places I’d want to live. Then a job opening in Edmonton came up. The job sounded right, so he applied. And they said please come interview. The weeks leading up to the interview we talked about whether we all would travel back to Alberta to visit. I spent time looking at real estate online. I started cleaning the house, so if we had to sell, I wouldn’t feel overwhelmed. Ultimately, we decided Geoff would travel alone, but we did make the trip known to someone in Edmonton. In case Geoff needed anything, I wanted him to be able to reach out to someone without blindsiding them. The interview went well, and Geoff called to say, we need to talk about this seriously. They were offering him a very nice job, a job with security. My mind wouldn’t calm down. The thought of picking up and leaving the U.S. consumed me. I talked to people about finances, selling the house, researched houses further. And all the while we prayed and talked about it. Each day I thought we were settled one way, and then we’d swing the other way. I didn’t want to commit to a decision until Geoff spoke to his bosses. I felt ill to my stomach. I did not want to make a decision of this magnitude. The morning of his meeting, he asked me, what do you think? I told him, it’s my dream to live here, to get the green card, and become a U.S. citizen. But my fear was that it wasn’t God’s dream for me. I had prepared myself that maybe some dreams don’t get realized. When Geoff’s meeting had ended, the decision had been made. We were turning down the offer, we were going forward with the green card application, with assistance from the University. We were staying in Colorado, and praying that God would be sovereign over the green card process. I got off the phone with Geoff and just cried. I knew I would cry at either decision. Because I had submitted to the idea of moving. I’ve been pleased that the support we have gotten from family & friends has been favorable. It’s made it easier to have peace. My father-in-law called it a “gutsy” move, but I sensed pride. We’re not taking the easy road. I likened the decision to playing Deal Or No Deal. We could have taken the case with $750K, but we’re holding out that we’ll eventually get the $1M case. And that million dollar case… that’ll be holding dual citizenships, Canadian and American. I was ecstatic to hear that the Top Chef Tour was returning to Denver this year. Geoff and I have watched every episode, including Top Chef Masters. I was intrigued by the idea of being able to taste a dish, since that is obviously missed by just watching the show. My excitement was pushed over the edge when I secured my tickets and found out one of my favorite chefs would be there. The chefs for the Denver tour would be Ryan Scott and Richard Blais, both from season 4. Richard is one of my fav chefs from the entire series. 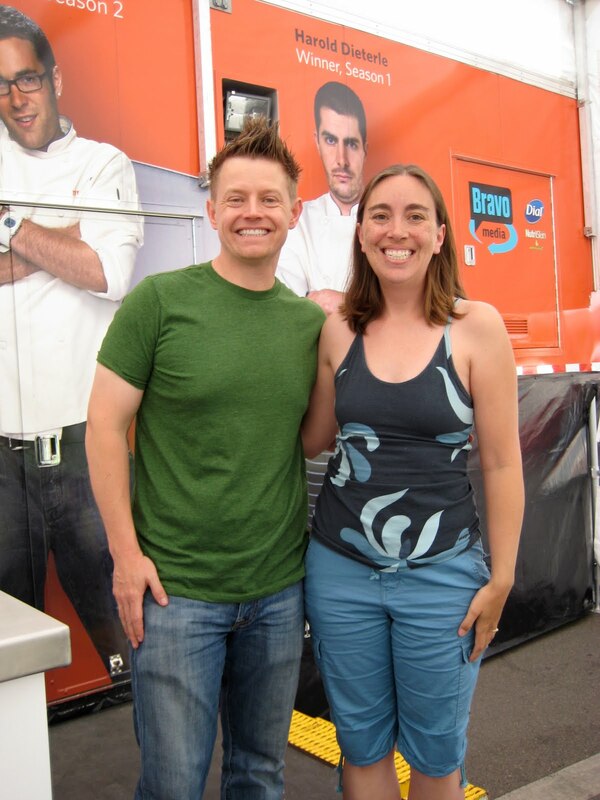 His talent, and love of cooking came across both on the show and in person. I had to restrain myself from getting all stalker on him and repeating to him stuff he had said on the show, 3 years ago. Hey, I told you I’ve seen every season, I also watch the re-runs whenever they air. I was able to meet both chefs, and enjoy some humorous banter while they cooked a dish for us and 40 other fans. What did I learn? 1. Ryan says always let your meat rest before you cut into it. He suggests you wait as long as it takes to drink 2 beers. 2. Every time you say “blaised carrots”, Richard gets $6 from the copyright. 3. If you are looking to add the umami (the 5th taste) effect to your food, add some worchestershire sauce. It was a fun event, and I would totally go again. I’m interested to see what lies ahead when Top Chef returns for season 7 next week.